Target Students: Adults in an intensive English language program at a university; advanced level. Language Focus: Academic reading and writing skills development-- read, analyze, and respond to variety of text types which correspond to a series of genre-specific writing assignments. Student Learning Objectives (SLO): By the end of this course, students will be able to efficiently apply both reading and writing strategies in relation to given sets of text types and purposes of reading and writing. Target Students: Adults in a community college ESL program; advanced level. Language Focus: Academic reading and vocabulary development—read and respond to an article on a current issue in education. of their strategy use with a learning strategy inventory. thorough and accurate understanding of a the text. Target Students: Adults in a survival ESL program; beginning level. 1. Recognize the terms by matching them with associated images. Target Students: Adults in a community-based ESL program; intermediate level. 1. 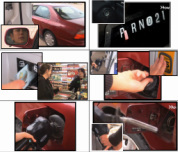 Recognize the target vocabulary by matching them with corresponding images. steps (in both written and visual formats) in the order that they hear them. Target Students: Adults in an ESL program; high-intermediate level. Student Learning Objectives (SLO): By the end of the lesson, students will be able to ask a landlord for repairs by writing a letter of complaint in which they must specify whom they are addressing [name of landlord], describe when/where/what happened, explain how it should be fixed, state what will happen if it is not fixed, and provide a signed salutation line with their contact information.